Nashville is a veritable breeding ground for the very best new music, no matter the genre, and Daniel Ellsworth & the Great Lakes is just one more piece of solid proof supporting this theory of mine. If you haven’t heard of them, it’s okay. You will, and very soon. 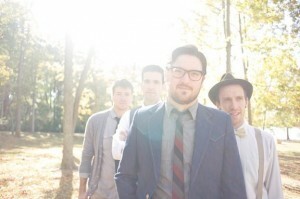 The quartet, headed by Daniel Ellsworth, consists of Joel Wren on percussion, Timon Lance on guitar, and Marshall Skinner on bass. Daniel handles the lead vocals, keys, and anything else that might come along. Because I was lucky enough to meet all four at the same time for a conversation, I gained a little insight about the band—where they’re from and where they want to go. The “Great Lakes” part of the moniker was adopted because of Daniel’s Minnesota home. He took the name as a solo artist, unaware that his future band would hail from Great Lakes states, too. Well, all except Joel, who’s from Kansas. “We have lakes, but there’s nothing great about them,” Joel laments. The current incarnation has been in existence since September of 2011, when Timon took over as guitarist. The band asserts that his presence has added a sharper edge, which in turn changes the way the music is written and recorded. The sound is more aggressive, prompting each member to proclaim in turn, “Timon is awesome.” They let me quote them on that. They also maintain they weren’t nearly as good looking until Timon joined the roster. The guys are thrilled with what they’ve accomplished in such a short time. Daniel was recently part of The Collective, a group of Nashville artists featured on NBC’s The Sing Off. This is brought a welcome influx of new fans who are excited to see what else the artists from the show can do. Amazon also named debut album Civilized Man one of the Top 100 Songs & Albums of 2011. These things don’t happen to just anyone, and most would consider this the pinnacle. The group is thrilled with the attention, grateful for the support, and humbled by the accolades, but they’re determined to bring us better, catchier, smarter…just more. Daniel Ellsworth & the Great Lakes isn’t easy to classify, but that just means they appeal to a wider audience. Others have tried to label the sound, calling them “indie synth folk popsters” and “indie rockers.” The guys even struggle to come up with a term that would encompass their sound, but that isn’t a bad thing. 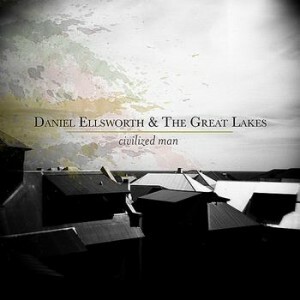 So what do you get when you listen to Daniel Ellsworth and the Great Lakes? There is a definite pop element, as the band creates infectious, dance-along tunes. The lyrics are intelligent, with subtle humor, setting them apart from mainstream pop. You’ll also get some Nashville flavor, the aforementioned synth sounds, some laid back blues, and some pretty inventive rhythms. It all adds up to one of the most innovative and addictive albums I’ve heard in years. You can start your Daniel Ellsworth experience with Shoe Fits, and I dare you to listen just once. The syncopated rhythm will crawl right into your bones, making itself known at the most random times—most painfully when you’re without your iPod or CD to quench your thirst for another listen. The band has released an official video, which you can see on YouTube, and I highly recommend a viewing, if for no other reason than to get a sense of what this band is about. This is fun in its purest form, and an excellent representation of the album. Most recently, Bleeding Tongue has been given the music video treatment, taking a significant turn from the carefree tone of Shoe Fits. It assures listeners Daniel Ellsworth & the Great Lakes can get serious—about videos, about music, and about life in general. It’s a reminder that, though these guys have amazing, fun-loving personalities, they’re also crazy smart. While it is pretty impossible to corral these guys into a specific genre, you may find the music is for you if you’re a fan of Fun., MGMT, Sufjan Stevens, or Motion City Soundtrack. If you’re intrigued, you can visit the band’s website or Facebook page to sample some tracks. The album, Civilized Man, is thoughtful and seamless on the whole and addictive by individual tracks. You’ll want to seek out Wolf Is Me, Kaleidoscope, Follow Me Home, and Surrender first, in addition to the previously mentioned tunes. To go whole hog and purchase the album, you’ll find it on iTunes and Amazon.